Success is sometimes your worst enemy and such may be the case in the world of Microsoft and software. Why upgrade to Windows 8, when Windows 7 is entirely satisfactory or for that matter, Windows XP? Similarly, for many users, just about any version of Office from the past ten years would likely provide more than ample utility for home use or even for a small business. I am fortunate that I am able to take advantage of the latest version of Office through my employer's Home Use Program (HUP). I recently received a notice from the HUP program that Office 2013 is now available for the nominal download cost of $9.95. You can also purchase the back up DVDs for an additional cost. When I last purchased Office 2010 through HUP, I noticed that I could create my own back up DVD so I thought I would skip the additional cost of the back up DVDs. As Murphy's Law would have it, this is where I spotted the first difference as upon purchase and clicking of the "download" link, Office 2013 installation was off and running. On the bright side, the installation proceeded without need for intervention and successfully installed without incident. That being said, I prefer more control over the install; for example, I particularly like to be able to specify what Office components get installed on my computer. I don't like bloat. I suspect (maybe hope) that the installation back up DVDs probably give you this control. I will also note that I do not have a new "touch screen" laptop so I cannot speak to touch functionality within Office 2013. Since this version is released post Windows 8, my intuition is that touch functionality may be one of the biggest reasons to upgrade to this version of Office. Despite the lack of touch functionality, my installation of Office 2013 on Windows 8 smoothly added the new Office applications to the Windows 8 Metro start screen. While more of a criticism of Windows 8 than Office 2013, this is a good illustration of missing the good old Start button. 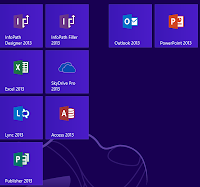 The many applications of Office 2013 each has their own "square" on Metro, hogging desktop real estate and requiring annoying horizontal scrolling as opposed to simply clicking the "Start button" and quickly finding your desired application. One of the most evident updates in Office 2013 is the attempt to integrate with Microsoft's SkyDrive which is provided as an option when you click "Save As". In fact due to my account set up and sign on from Windows 8, Office 2013 identified my SkyDrive as a potential storage location. Some may really like this feature. As one suffering from Old Fart Syndrome, I do not. Once again, this may be attributed more as a criticism of Windows 8 than Office 2013. I do not like the idea of Windows automatically "signing me in" to multiple resources; it makes me wonder about security implications and frankly scares me a bit. Similarly, I do not like "Live Update". I want to know what is getting updated on my machine. Upon installation, I began to look through the new product to find potential compelling reasons for an upgrade. I began my cruise through Microsoft Word and took Microsoft's canned tour where I spotted their advertisement of being able to edit PDFs. If Word 2013 could open a PDF and enable light editing of a PDF while preserving its form, it would be an upgrade worth paying for. In prior versions of Word, you were able to import PDFs, but the formatting consistently does not hold up in the conversion. I was hoping maybe this had changed; it hasn't. To test, I downloaded the general instructions for completing the 1040 federal tax form. As shown, is the cover page as it appears in the original instructions for 1040 (left) versus the appearance after being opened in MS Word 2013 for editing and saved as a PDF (right). This message should terrify anyone and for me is a clear deal breaker. Having taken a quick spin with Word, I moved to Excel. One of the potential improvements in Excel 2013 (and perhaps Word 2013) is that the choice of templates appeared more visually appealing to me. 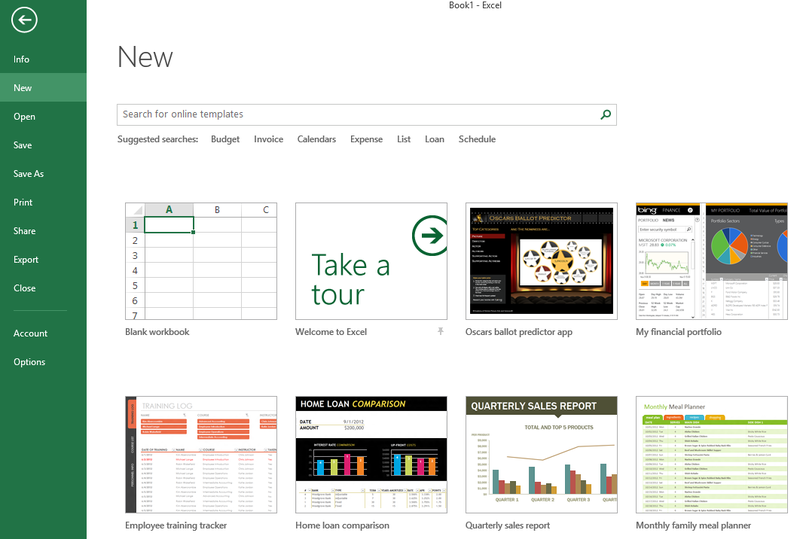 In similar fashion, I selected Microsoft's "Take a tour" template. 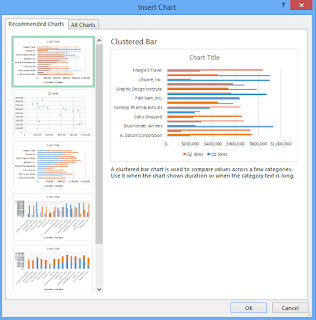 This template introduced 3 enhancements in Office 2013. Based on my experience with Excel, I found 2 of the 3 to have promise. First, was the "Flash Fill". Prior versions of Excel had some ability to detect and auto fill patterns. Excel 2013 looks to go further with this ability. I often use lists with data such as email addresses as shown in the example so I will be excited to play with this enhancement a bit further. The second enhancement that piqued my curiosity was the "Recommend Charts" enhancement. 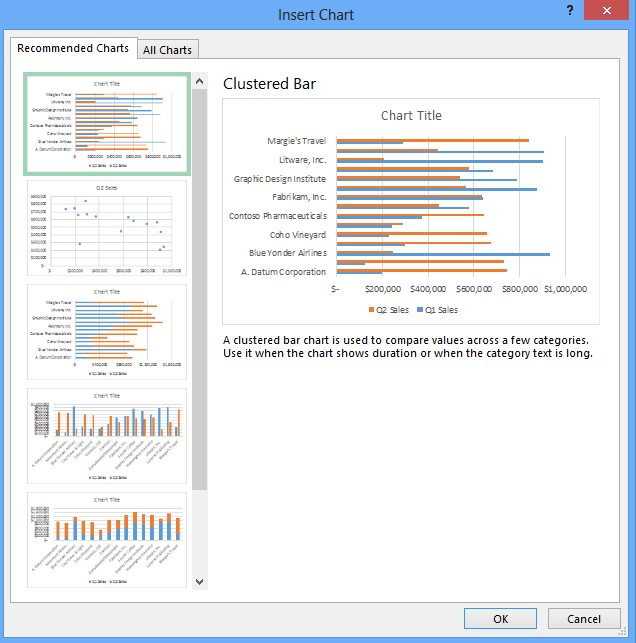 Basically, the concept is simple, you select the data that you want to chart, click the "Recommend Charts" button and you are provided a screen similar below to preview likely desired charts. The 3rd enhancement that the tour provided and the one that did not arise much excitement for me was the "Analyze" enhancement. Excel has long provided "predictive" type features in its product. More likely than not, it is not so much Excel's feature, but rather the data that I have found to be the issue as often there is much more behind the data than raw numbers and it is that knowledge that is critical to understanding and predicting true future paths. Thus, another "analytical" type tool did not have much appeal for me. Throughout, my tour of Office 2013, I made use of Microsoft OneNote to create the screen shots used in this post. I have found OneNote to be very useful for this purpose although I will note that this functionality has long been available since the 2007 version. Just for fun, I also took a cursory look at Access 2013. I had read that Microsoft had discontinued support for .adp type Access files in 2013 and that certainly appears to be the case. I am very sorry to see this gone. (.adp files were used by MS Access to connect forms and reports to back end SQL Server tables and views. This was a very handy way to leverage the power of SQL Server with the user friendliness of MS Access). On the flip side, it appears that Microsoft has chosen to integrate Access much more tightly with its SharePoint product. The obvious obstacle for the customer is that many customers may not have SharePoint. I also took a very quick look at PowerPoint. Again, the enhancements seem to follow similar paths as described for Word and Excel. PowerPoint 2013 appears to have flashy new templates and also appears to tie the product to the Cloud and also to internet sharing more tightly than in earlier versions of Office. In summary, I found that for my particular needs, any true gold nuggets in Office 2013 were obscured by clouds. If you are running Windows 8 and require substantial collaboration and sharing of Office documents, you may want to explore upgrading to Office 2013. While I was not able to preview touch screen features, I am skeptical as to whether this capability would be worth a substantial investment. The reason I make this statement is that when I use Office software it is generally for some rather vigorous, keyboard intensive work such as writing or inputting data. For typical users such as myself, I was unable to find a compelling reason to shell out any substantial sum of money for this upgrade, but for $9.95, I'll take it.